Here’s one more reason to get excited about the launch of bike-share later this year: the reams of data generated by the GPS units located in every public bicycle. The Department of Transportation will use that data to inform their bike lane planning, commissioner Janette Sadik-Khan revealed last night. Right now, data on individual bike trips are very scarce. While bike-share trips aren’t representative of the larger set of bike trips, the ability to track exactly where a large set of riders bike and at what speeds could be quite valuable for bike planning. DOT has used taxi GPS data to measure traffic speeds in Manhattan and evaluate initiatives like the pedestrianization of parts of Broadway, and there’s far more that can still be done with that kind of rich data set. Bike-sharing could start to build a similar toolkit for bikes. The GPS data, which will be owned by the city and made publicly available to the extent possible, will provide even more information than exists in other cities with bike-share. 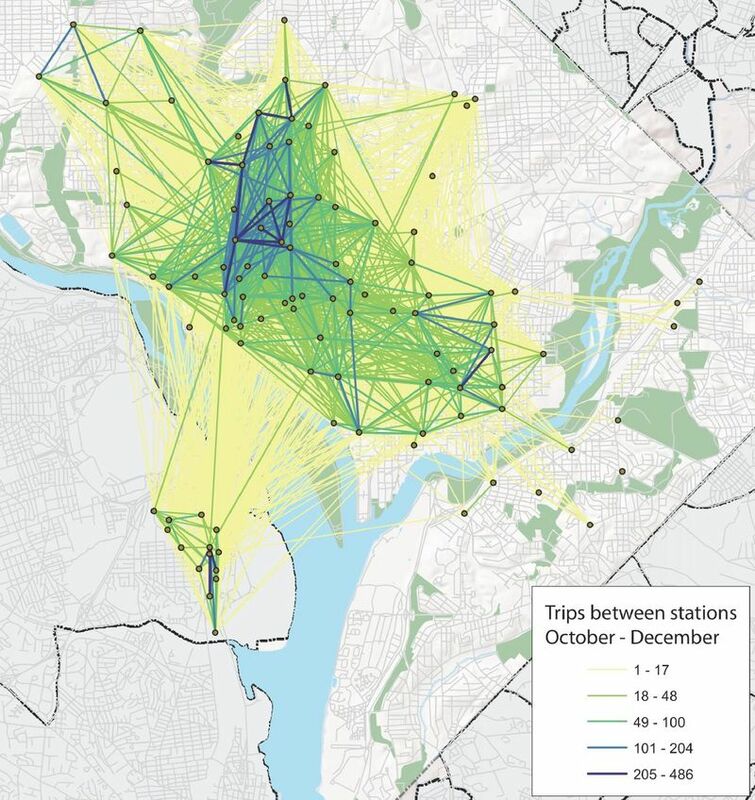 In D.C., for example, there’s excitement about a new data set that only shows which stations Capital Bikeshare riders are traveling between, not their exact routes. What would you do with bike-share GPS data? Let us know in the comments. So many possibilities. How far will people deviate from a direct route to take a bike lane, or a cycletrack… Before/after studies of routes and volumes after installation of a facility… Correlation between bike volume and auto volume/speed…. Grad student dream come true. Sounds like the data might be a little biased by the locations of the bike stations. Still, it’s better than nothing. The big killer app for bikeshare bikes is those trips that for are bottlenecked for all other modes, for whatever reason. In Boston, a good example is trying to get from one side of Kenmore Square (i.e. Fenway Park) to another. Once City Hall can identify those trips, it has good data on how to fix it for non-bikeshare users. One useful thing I can think of: if and when, god forbid, there is a serious crash involving someone on a shared bike, we might finally be able to get some credible information about the path of the cyclist in a crash, instead of PD’s usual bumbling sh*tshow of an accident report. That is, if they don’t withhold it because the investigation is “open”. One thing I would love to see is the safety data – how many miles bikes per accident? Where are the safer streets? Average length miles & time of a trip? Speed of bike vs taxi or bus (or walking) along same routes. I think bike share’s sweet spot will be for 1-3 mile trips instead of walking or where mass transit is not covered or performs slowly. if the data is in sync (has time, as it should), i would check use patterns – do bike sharers pick up the bike, head to their destination, and return them, or do they take the bike places. and the ones that do – where do they go? That GPS data will be really handy tracking down those bicycling terrorists on 2nd Ave.
Let us just say preemptively that when the data is released, we won’t believe it, and we intend to sue for the real data. For the record, our spy camera has yet to record the presence of a single NYC bike share bike, except for that demo those horrid “Park Slope Neighbors” and the Department of Transylvanians conducted last October. At last night’s event Alison Cohen mentioned that average trips in DC and Boston were somewhere in the neighborhood of 1.3 or 1.4 miles. (I can’t remember the exact figure.) I’m looking forward to seeing that figure here and how the averages differ by borough. I can imagine we’d get a lot of extremely short trips in Midtown – someone going from Penn Station to, say, 26th and 5th – while in Brooklyn we’d get some longer ones – Park Slope to Williamsburg, for example. Marketing. As in the average trip from Penn Station to the vicinity of 50th and Park takes X minutes. To be marketed on the LIRR, at least until ESA opens in 2168. Yes, if you live in an area that will have bike share. I don’t think cyclists in Queens will be getting much use out of this. Identify the renter via payment records and sell the data to health insurers, credit monitoring firms, and other big data companies. Give the data to the NYPD, DHS and other police and intelligence agencies for surveillance, profiling, and data mining. Install red light cameras and use the data to ticket violators. We know there will be a serious accident involving a bike share rider, just as there are serious accidents with any mode of powered transportation, cars/bikes/trains/airplanes/etc. The more data we have on them, the better. I’m wondering about the privacy of the data (Like Me below but less sarcastically). Will they link the GPS data to the renter? The bikeshare system is scheduled to expand citywide in the future. For now, it won’t even serve Manhattan above 79th Street. When it starts, though, anyone who spends any time in Manhattan or inner Brooklyn will be able to benefit from the system. Say you live in Jackson Heights and take a shopping trip to Union Square. Naturally, you’d take the subway there. Afterwards, if you want to head over to the High Line, you could take the L, and walk. Or you could take a bike share. The bikeshare is a 6 minute trip, while the L is 9 minute trip. And that is for a trip that directly parallels a subway line. If you have a transfer, the bikeshare is way faster. This month the LA County MTA Board will review a report regarding the implementation of Bike Share in LA County. We spoke and consulted with professionals involved in bike-share programs outside Los Angeles. We invited professionals that planned and are implementing bike share programs in several US cities. Policy makes, transportation planners and academia are interested in understanding and measuring bike usage. At the symposium we conducted we discussed the need and value of understanding and collecting bike ridership trips. Bike share technology allows for tracking trips and certainly it can and will create new data to better understand urban mobility. However, riding a bike is a human activity fairly close to waking as such it says more about the make up and/or quality of an urban environment. If a city does not facilitate and sustain bicycling and waking then these practices will be minimal. The “engineering and data collection” of bike and pedestrian trips is not as critical as the understanding of the urban environments that impede or facilitate these activities. It is also important to note that when “ordinary” people walk and bike the a city has accomplished something “extraordinary” . The city has has created the environment that motivates these actions. In addition the “bike sharing” is a qualitative and cultural evolution of an urban environment. Qualitative in the sense that city has created a new mobility option and cultural in the sense that this mobility option includes the common sharing of a bicycle. somehow it’d be great if the gps data could track the direction of rides…i think when all of these bikes hit the streets with more and more novice riders we’ll see many more cases of bicycle ‘salmoning’ where cyclists go the wrong way on one-way streets, or far worse the wrong way on the avenues (which should be 2-way). That is an invasion of privacy. They’re practically filming us without us knowing. Also, what happens if a bike crash happens and the bike is damaged? On the bright side, that GPS data will probably keep track of the bikers that always go the wrong way down one-way streets and don’t pay attention to people who want to cross the street without being flattened to a pancake. No thanks, I’ll take my own bike. I doubt the GPS data will be precise enough to help with that information. It could provide speed information though.